The home of America’s most significant art holdings (Dali’s The Persistence of Memory, Van Gogh’s Starry Night, Pollock’s One), New York’s Museum of Modern Art is as good as it gets. Apparently, Director Glenn D. Lowry is also as good as it gets, as he was the highest-paid museum director in the country in 2008, which is also when his previous contract ran out. The MoMA decided to keep him as its director, and his salary of almost $2.5 million reflects the hefty signing bonus that surely sweetened the new deal. After all, his 2007 salary was a paltry $1,264,818 in comparison. No stranger to controversy over his salary, Lowry was taken to task in 2007 for questionable reporting of his salary to the IRS, and for his rent-free apartment paid for by the museum. Kinetic Partners is a global professional services firm focused exclusively on the asset management, banking and broking industry. We provide audit and assurance, tax, regulatory compliance and consulting, corporate recovery and finance, and forensic investigations to both traditional and alternative investment managers. Kinetic Partners advise over 950 clients, including many of the world’s largest hedge funds and traditional asset managers. Established in 2005, Kinetic Partners now operates out of London, Dublin, Grand Cayman, New York and Geneva. The Durst Organization signed a nearly 12,000-square-foot lease for Staples at its 32-story building at 675 Third Avenue, at 42nd Street, the company said. Staples was represented by Chase Welles, executive vice president of brokerage Northwest Atlantic, while Durst was represented in house by John Grotto, a vice president. Investment Management Software, Services :: SS&C Technologies, Inc.
Investment management software, financial services for investment management, and outsourcing services for investment management. About SS&C :: SS&C Technologies, Inc. Reviews and ratings of TRW Business Cr at 675 3rd Ave New York, NY, 10017. Get phone numbers, maps, directions and addresses for TRW Business Cr. Andreas Dressler has been active in foreign direct investment (FDI) for 14 years. He assists companies to develop international expansion strategies, select the best locations for their operations, and negotiate favorable conditions for their investments. He also works with countries, regions and cities to implement investment attraction strategies and secure new FDI projects. For more than 13 years, Andreas worked with one of the “big-4” professional advisory firms, where he created a specialized FDI practice and managed a global network of over 100 location advisory consultants. After 8 years in the US (Washington DC and New York) he moved to Germany in 2003 to build a market-leading FDI advisory group in Europe. In 2009, Andreas established Terrain, an independent consulting firm providing services to economic development agencies and companies worldwide. A particular area of focus is assisting economic development agencies to develop investment attraction strategies and identify investment leads. Through this extensive experience, Andreas has developed an in-depth understanding of how companies in different industries make location decisions and what it takes for locations to attract them. Andreas has lived in eight countries and speaks five languages. He has a Master of Arts in International Relations from the Johns Hopkins University, School of Advanced International Studies in Washington DC and a Bachelor of Science in Business Administration from the University of Bath in England. Ray Garfield has more than 35 years of experience in the development, finance and asset management of all property types. With an extensive Wall Street background, Mr. Garfield focuses primarily on working with investment banking partners and bond counsel to engineer creative financing structures and secure capital for developments. A proven track record demonstrates his ability to create insightful and innovative delivery vehicles for challenging assignments. Additional responsibilities include management of corporate relationships, participation in value engineering meetings, negotiation of project documents and agreements and leading problem solving of political, legal and financial issues for clients and their essential developments. Prior to forming Garfield Traub, Mr. Garfield served as Chairman and CEO of Vista Properties, Inc, a publicly held national land development company with more than 9000 acres of urban land in its portfolio. In addition to overseeing the development and sale of properties in Vista’s portfolio, Mr. Garfield guided the company through a merger with Centex Corporation, the nation’s largest homebuilder. As Senior Vice President and Managing Director of Cushman & Wakefield, Inc, Mr. Garfield managed the Financial Services Division for the western half of the US. In this capacity Mr. Garfield directed the sales and financing of major properties throughout 21 offices from Texas to the Pacific. During his tenure his division was responsible for more than $2.5 billion of transactions for hotel properties and major commercial properties. As Vice President of Salomon Brothers, Mr. Garfield originated and closed more than $2.5 billion in capital transactions through his investment banking responsibilities for a host of major international clients including WalMart Corporation, Weingarten Realty, Inc., Trammell Crow Company, Lincoln Property Company and Pratt Hotels. Mr. Garfield and his real estate securities division pioneered the creation of the nation’s first commercial mortgage backed securities. Prior to that, Mr. Garfield served at Merrill Lynch Commercial Real Estate as Executive Vice President, Chief Operating Officer and Manager of National Sales for Merrill Lynch’s commercial real estate services offices throughout the US. And then I looked up this just to make sure it says what I thought it has been saying all along – that the population to employment ratio is 58.2% – that means, there is not 90% of America employed. It can be counted as maybe the 64.5 percent are employed (some part-time despite what they need or desired to do), which means not all of the 64.5% employed are actually working full-time, nor does it mean they are making the 2005 or 2007 average salary declared for all Americans by the Labor Department of a little over $50,000 a year. Not even most teachers make that kind of money – how many jobs are there that even do make that much in America, after the hours are cut to twenty a week? industries changed little in November. Ms. Elizabeth Warren was on bloomberg this weekend for an interview and claimed that 90% of Americans are employed – apparently they really believe that in Washington, D.C. – nothing says that in these figures . Are they morons or what? At the very least, people such as Ms. Warren should know better and not be spouting off the nonsense that 90% of Americans are working – nowhere in America is there evidence of anything close to that number – nowhere! But this was the most surprising thing to find – here is the man among men who helped bring down America’s economy (among others) still holding a high salary and place of honor despite the foundation of our economy being taken out from under us by him and his team of nitwits and cons on Wall Street / Salomon Brothers / Lehman – they’ve sold America down a really bad river without a canoe, let alone a paddle and here these people are still worshiping him and others like him . I’m sure there are others speaking for that leadership conference who are a real piece of work, too. I just found it too hard to pass up – this man bragging about his part in all of it that we are still paying for to this day and will be for sometime to come – maybe all the way into my great-great-great-grandchildren’s generation. I don’t think he has anything to do with the Garfield Development Corporation – it just accidentally led me to stumble upon him and get to acknowledge his efforts to create the commercial mortgage backed securities that brought our nation down to its knees while he and his buddies made their fortunes off the process . . .
And who will be asked to give their opinions about what to do about poverty and joblessness in America? Guess who from the above list? Will it be anybody who’ve suffered at the hands of these things? No – of course not. It will be people like the ones who created the problems we are living with that will get to answer those questions and settle those policy issues, of course. Only in America. You know, several years ago – the State of Georgia announced proudly that it was spending over $35,000 a year each year on paperwork to track the homeless per homeless person in Georgia – and (it was over ten years ago, I’m sure – it would be $150,000 a year per homeless person to track them this year or last year or the year before) – and I said at the time, that with $35,000 – who would have to be homeless? Chabad’s Children of Chernob YL in New York, NY — Map, Phone Number, Reviews, Photos and Video Profile for New York Chabad’s Children of Chernob YL. The building height is 365 feet. The building has 32 stories. Since 2006, The Durst Organization (who has this building) has had the only First Responder In-Building Communications System that enables First Responders (FDNY, NYPD, and EMS) to communicate within the building. 205 E. 42nd Street building adjacent is also owned by the Durst Organization. The building has 342,000 square feet of space (area). I had always thought of hedge funds being in Connecticut or somewhere, not down the street from the UN building with the mission of Belize and half the Caribbean under the same roof . . .
My Note – That is just in that one zipcode where this building is located in NYC. … interest-free loans for philanthropic purposes within the New York metropolitan area. 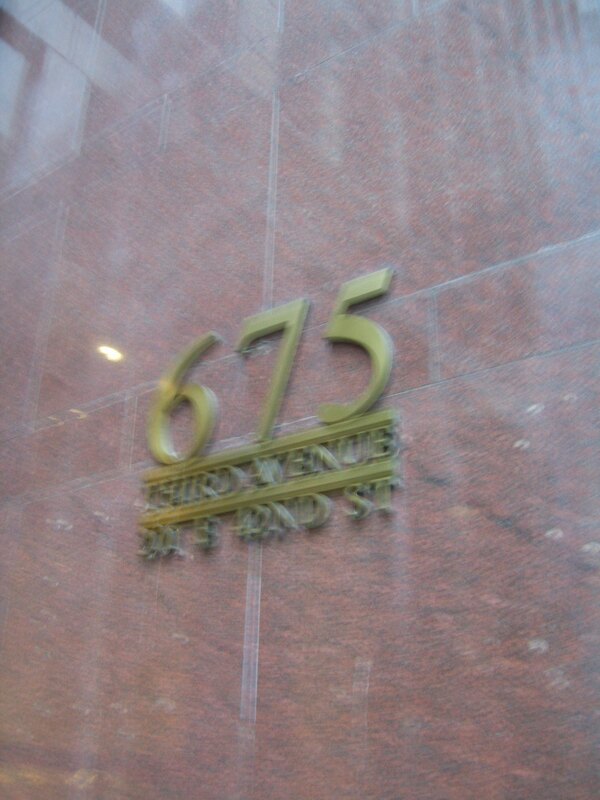 … 675 Third Avenue | Suite 1905 | New York, NY 10017| 212-687-0188. Durst’s dead-on foresight was particularly acute when it came to investing in Times Square in the late ’60s and early ’70s, when the area epitomized the city’s decline. At one time, the Durst Organization had stakes in 10 acres of Midtown, which seemed doomed to everyone but Durst. Durst’s confidence about the fate of Midtown and Times Square perfectly positioned his company for its future, signature developments, including the Condé Nast Building at 4 Times Square and the Bank of America Tower. And while those buildings were constructed after his death, they have his vision written all over them and are trailblazers in the New York City development world. Douglas Durst said, “My father started the assemblage at One Bryant Park in 1957,” when he first began buying up the lots required to build there. In the late ’80s, when other developers poured money into huge office towers on the West Side before they had tenants lined up, Durst waited to begin building at the 114 West 47th Street site until a tenant had signed on to occupy at least half the space. He then insisted he would halt development if the tenant, the United States Trust, exited the agreement. While many sites became fiscal liabilities for their backers, Durst’s buildings paid for themselves. It wasn’t just the environment that the Dursts have wanted to clean up. Seymour Durst raised awareness of government spending, too. The iconic “Debt Clock” erected near Times Square that tallied the growing size of the national debt was his idea. The clock was stopped in 2000 when the numbers started ticking backwards, despite being in the trillions. Around the world there are concept cars, hybrids, alternative fuel designs, and electric car options, but over the many years of these being designed and engineered, they never seem to come to the marketplace. Thirty years ago, air pollution and environmental concerns were known. Even then, the problem was massive. Some things have been done, but when it comes to transportation choices, it always seems to be hindered and nothing of real change occurs. When NOX devices were required in the US, a trade-off was established. By reducing some emissions, others were enhanced. As a result, we now have exotic chemicals with names as long as two lines on a page, that hover throughout the air and in the landscape where we all must live. Around many roadways, freeways and surface streets, the air quality varies from barely breathable to smelling like standing in an enclosed garage behind exhausts from revving engines. Depending on the lay of the land and the air currents, on any American thoroughfare where rush hour traffic sits twice a day, there are concentrated areas of exhaust fumes that sit socked in and stagnant for hours. It used to be that only large cities like Los Angeles had air quality alerts bad enough to require people to stay inside, not walk, not play outside, and not be involved in outside activities. Now that is true in counties, states and cities across the country with many varied population numbers and concentrations of industry, traffic and business. And, all this time, there have been designs to solve these problems. There have been cars that could be moved down the road without the same polluting constituents. Throughout this time, there have been ways for businesses and industries to cut down on pollutants going into the surrounding environment. They simply didn’t use them or sought to do as little as possible about it rather than being a conscientious participant in their communities and in our opportunities for quality of life as a whole. It is very frustrating to consider that across the world, options exists that never are available to us. Not only are they not created in the US, they are not available in the US either. And, things created and engineered in the US that might solve these problems are not made available either. It always seems to be ten years away from availability, no matter how much it is needed and no matter how much money has already been made available to get the job done. How is that possible? It is not just banks and business being hit by the world financial crisis. Towns and cities in Europe are seeing their budgets strangled as tax revenues tumble. Once one of the richest places, Wuppertal in Germany is now on its uppers, hoping to benefit from Berlin’s multi-billion-euro recession rescue package. I watched this video when I found it a couple of days ago and it has been on my mind. The county where I live in Georgia, the city of Atlanta nearby and cities, counties and states across the United States have the same problems as described in this video clip about Wuppertal in Germany. And, in many ways, the money problems exist in our communities for the same reasons. This is true across the world apparently. Money has been borrowed, tax revenues have declined and the lion’s share of new moneys in loans and revenues are being used to pay interest payments rather than to provide for the needs of the communities. That seems to be undermining the opportunities for cities and communities to thrive and hindering options for any appreciable future quality of life. It could be that some method for restructuring these debts needs to be created such that old loans can be paid down or paid off and newer ones made with lower interest rates or with access directly to the Central Banks’ loan windows with no interest rates whatsoever. It is absurd that something effective is not being done for anyone in any great measure, except the banks and financial institutions. Banks and financial institutions are not a person and are not the community; do not constitute a continued value in the current structural forms by which they exist now; are not equal to the job that they must do (apparently); and they have been, and continue to be part of the problem rather than part of the solution. Their business profits are based on the use of resources that come from individuals, from communities and from our jointly created and jointly underwritten government resources. The previous credit and leverage banking business and finance model doesn’t work at this point because it must fit with the greater needs of communities, people, businesses, and the activities of human lives and human accomplishments. And, it currently isn’t doing that. We need answers that work and they are needed right now. Gender equality in Europe is still a distant goal, but the pay-off is undeniable, in economic terms as well as human. Sweden and Spain are among the countries setting good examples. People have been rather horrified to have to live on the income of only their family’s female counterpart in the current economic difficulties when male breadwinners have lost their jobs. That is because, in the US pay for women is still significantly lower than that for men doing the same or a comparatively similar job. Pay averages for women are lower by two- thirds and more in some jobs, some states and some industries. But then, in the US – our “right to work” States actually mean, “right to be fired without cause and without recourse.” So, what do we expect? In fact, there have been recent efforts across the US, to drop safe work environment standards, reduce requirements on businesses to allow employees time for lunch and for breaks, and to change regulations concerning overtime and benefits for workers, among other things. They don’t need people working for these businesses, they need to go out of business and let some user-friendly, worker-compassionate, community-conscientious businesses have their place in the market. LEUVEN, Belgium, April 13 (UPI) — Belgian brewing company Anheuser-Busch InBev NV is considering selling its “small town” Pennsylvania brand Rolling Rock, sources said. Anheuser-Busch bought Rolling Rock three years ago from InBev NV for $82 million, The Wall Street Journal reported Monday. Last fall, InBev turned around and bought Anheuser-Busch for $52 billion. It is now selling assets to help cover some of the debt incurred in the deal, the newspaper said. In 2004, 11 million cases of Rolling Rock were sold. In 2008, only 7.4 million cases were consumed, Beverage Information Group said. Same old story. Buy a large company using the “plays and games” of leverage and then sell anything not nailed down to raise the money needed to satisfy the leverage / credit used to buy the company. And round and round it goes. It is a rigged game.